Linear Jewelry - This is a unique and bold handcrafted sterling silver bracelet that makes a big statement. 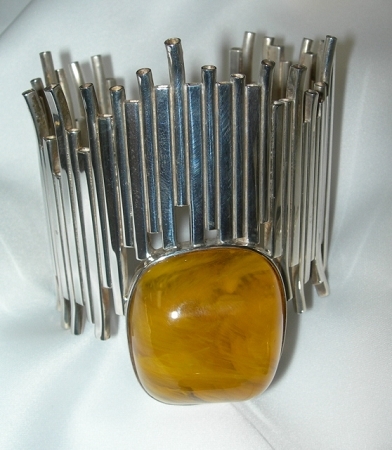 The wide cuff is created from long round silver tubing soldered together and features a large chunky yellow Copal Amber (from Tanzania) cabochon. From our Linear Collection, this is a handcrafted sterling silver bracelet that is bold and makes a statement. The bracelet is created from long square and round silver tubing soldered together.The bracelet is designed to fit somewhat snug on the wrist or arm to avoid the bracelet from turning.The bracelet cuff features a large chunky freeform Copal Amber Cabochon that is fully encased in sterling silver. Each Copal Amber cabochon is unique and will be approximately the same size as this picture. Copal Amber is from Tanzania and is a younger Amber than the Baltic Amber. The Bracelet is approximately 2.25" wide in the front x 2.5" wide in the back on one side and 1.5" wide in the back on the other side. The Copal Amber Cabochon is approximately 1.5" long x 1.25" wide (40mm x 30mm).